eRAD automates the business and clinical workflow of medical imaging. The result? You get enterprise-level collaboration, hassle-free compliance and improved patient care. Flexibility counts. eRAD’s cloud-based architecture makes it ideal for distributed sites and remote communication. Its web delivery means that users can access applications anytime, anywhere. You can integrate each module with eRAD PACS (Picture Archiving Communication System) as the heart of your platform or operate modules singly with disparate existing systems. Our EHR-Certified RIS (Radiology Information System) delivers multi-site productivity, real-time analytics, roving speech recognition and resource optimization. eRAD offers a state-of-the-art PACS solution for radiology imaging workflow. With a flexible infrastructure, enhanced data security, advanced web technology and a modernized user interface, eRAD PACS Evolution takes productivity to a new level. Not all PACS are alike. With full support for distributed environments, eRAD enables reporting from anywhere. We innovate with embedded speech, sophisticated pre-fetch and mobile viewing. LEARN MORE about our web based PACS systems. With a single login and intelligent study routing, you can exponentially increase productivity. The enterprise becomes one streamlined reading and reporting platform. Dictate directly into the eRAD reporting workflow, while scrolling or manipulating images. Roaming profiles enable consistency and productivity for measurable results. Embedded dictation, customized hanging protocols, user-defined interfaces—users can access their profile at login from anywhere. You can collaborate anywhere you get Internet access with our web-based PACS system. eRAD’s zero-footprint, HTML5 browser-based web viewer enables clinicians to securely access, manipulate and share exams on mobile devices—without technology roadblocks. MQSA- and ACR- compliant Breast Imaging Reporting and Data System (BIRADS) coding and tissue density drive a closed-loop follow-up workflow, for the best possible outcomes. Tracking can be integrated with third-party systems. What if you could get a full toolset for breast imaging without a dedicated mammography workstation? eRAD could save hours of productivity and thousands in support costs. eRAD’s clinical communication tool securely sends email / text / voice messages to patients—for appointment reminders and education—and clinicians—for critical test results and other collaboration. 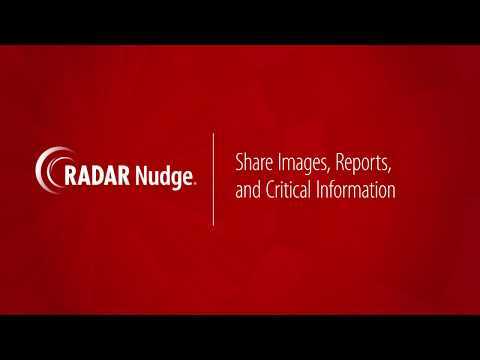 RADAR Nudge enables secure, fast teamwork among clinicians and administrators. No matter where each colleague is located, issues that can be addressed instantly are handled instantly. RADAR SecurePIC enables faster and more accurate capture of patient information. Patients securely send photos of prescriptions, insurance cards, referral forms—any document—for immediate, direct transfer to the patient folder. eRAD enables referring physicians to use an easy interface for 24/7 access to patient results. Support extends across disparate devices and requires no training or install. Engage your patients. eRAD’s Patient Portal enables patients to schedule their own appointments and securely access reports and images online. Improve clinical outcomes and patient satisfaction with our fully integrated Patient Portal. Fault-tolerant architecture, vendor-neutral archiving, integrated DICOM server gateways—these are only some of the ways that eRAD’s back-end technology drives optimum reliability and performance. eRAD’s vendor-neutral archiving puts data on your screen quickly, whether it originated from a CD, a legacy system, a video file or a lab report. In partnering with eRAD, Prime Medical Imaging has seen a great response and growth in our referral base over the last three years, and this is due in part to the web-based eRAD product’s accessibility and ease for referring physicians. eRAD support has always been a marquee quality in service to us as an independent, free-standing medical imaging center. We have gone through two upgrades to our eRAD system over the last five years, and we have always been able to rely on eRAD to provide the latest in technical advances to keep our practice at the forefront of technology. If, on occasion, we did encounter any issues, eRAD was extremely prompt in addressing those concerns. Overall, Prime Medical Imaging has been extremely pleased with the eRAD product, and we look forward to continuing in our partnership in providing the best in medical imaging services and delivery of those services to the referring offices.